Understanding how the eyeball interprets color is essential for creating color palettes in certain media. 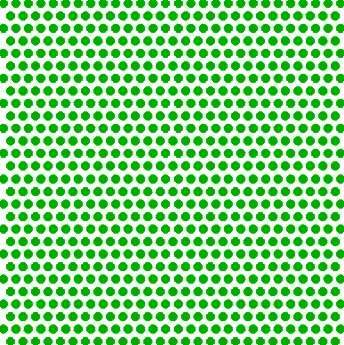 Color printers, which typically use 3-4 colors (sometimes more), and televisions, which use red, green and blue only, are a couple examples of devices that use dots or pixels to display color. 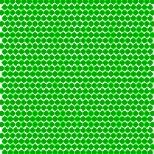 Instructions: The following series of images begins with a collection of dots that are clearly green and have significant amounts of space in between them. 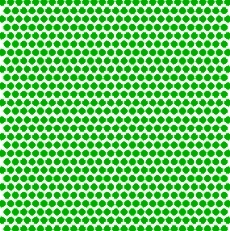 Reducing the original image, we notice that the colored dots seem to blend together and a coherent color appears solid in the final image. Using similar methods, it is possible to mix colors by simply altering dot formations and limiting white space. Both RGB (television, computer monitors, film projection) and CMYK (4-color process) use this technique.